In April KFTC members launched the Power House Project, an exciting effort to build New Power in every sense of the word: new economic power, new clean energy power, and new political power. A centerpiece of this project is a free, two-hour workshop that provides do-it-yourself strategies and resources for weatherizing our homes, trailers and apartments to save energy and money. The Power House Workshop also offers an overview of how rural electric cooperatives and other utilities in Kentucky operate. And it explores ways people can work together to build grassroots political power to push for – and win – better energy policies and programs from utilities, the Kentucky Public Service Commission, and our elected officials. To schedule a workshop in your community, contact Nikita Perumal at nikita@kftc.org or 859-276-0563. The first two workshops were held on April 7 and 8 in Pulaski and Bath counties. Both were very well attended and received. In addition to a packet of tips and resources, participants went home with new relationships, understanding and an energy-saving kit worth about $25. At the start of the workshop, each group reviewed several maps of their county showing where different utilities operate and how local rates and bills compare to state averages. One of those maps, shown below, highlights the energy burden experienced by people in different regions of Kentucky. Energy burden is a term that describes how big a bite average electricity bills take out of the median household incom of an area. It's important to remember that the actual energy burden for each household depends on their actual electric bills and their actual income. 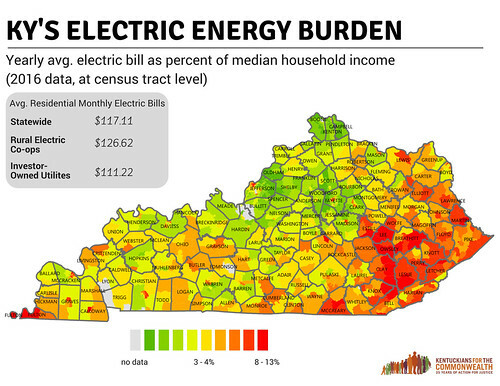 Many low-income households in Kentucky experience significantly higher energy burdens than the averages shown on this map. An interactive version of this map will soon be available on KFTC's website, along with all data sources. Below are links to some of the materials used in these workshops. * Tips for saving energy and money in your home, including many links to resources and videos. 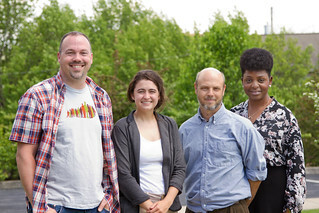 Special thanks to KFTC members Rachel Norton, Chris Woolery and Chris Porter, plus KFTC organizing apprentice Nikita Perumal and Research and Data visualization specialist Laura Greenfield, for sharing their expertise, time and wisdom to design and lead these workshops!